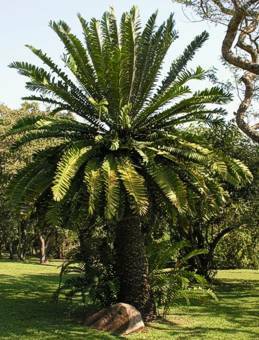 Cycads are the most significant collections in the Lowveld Garden. Although these incredible trees are scattered all over the Garden, the main concentration occurs in the vicinity of the guest cottage and the Tea Garden. It is one of the best conservation-orientated plant collections in Africa. This collection ranks extremely high in species diversity with a large number of striking, mature specimens. 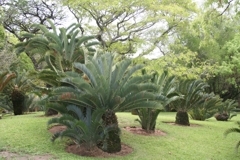 The Garden established the very first cycad gene bank in South Africa, thus playing a pivotal role in the conservation of cycads generally and, in particular, of all rare and endangered species. Cycads are woody, cone-bearing plants. Due to their appearance, cycads are sometimes erroneously identified as palms or ferns. Cycads are a unique assemblage of plants, and although they are grouped with gymnosperms, they are in fact unrelated to any other group of living plants. The genus Encephalartos is the largest in the Cycadales, consisting of about 52 described species and a number of others yet to be named. They are restricted to the African continent with more than half the species occurring in South Africa. While some species of Encephalartos have a fairly wide distribution, others are remarkably localised and a few are known to be restricted to a single river system or even a solitary hill. Cycad genera (from diverse areas in the world) that can be seen in this section of the Garden are: Bowenia; Ceratozamia; Cycas; Dioon; Encephalartos; Lepidozamia and Macrozamia.